With an increasing number of stories in the media about contaminated drinking water, there has never been more pressure on municipalities to provide safe drinking water to their residents. In addition, when it comes to environmental and health issues, municipalities are also facing increasing budgetary concerns. When you put all these factors together, the scenario for municipalities is that they must find water purification solutions that fully meet their safety, regulatory and budgetary needs. Our water treatment systems meet today’s most challenging purification needs – such as the removal of EPA-listed contaminants like PFOA and PFOS. In addition, our treatment systems are NSF/ANSI 61 and 372 certified and one of the only manufacturers that can design, develop, build, and install a totally certified and comprehensive water treatment system. Municipal Water Treatment Systems from TIGG are designed for local municipalities and communities to handle and ensure quality water purification for their customers. We offer a complete range of water treatment equipment and systems including vessels, media, and media exchange services to handle ongoing water treatment operations. Municipal water treatment operators providing residential and industrial potable water use NSF-certified TIGG purification equipment, activated carbon adsorption media and spent media exchange services for removal of disinfection byproducts, VOCs, organics, and solids in the municipal water treatment market. 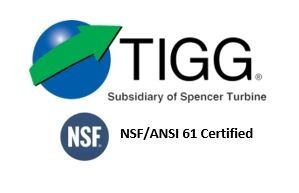 TIGG sells and rents drinking water purification equipment such as sand filters, multimedia filtration units, pressure filters, and other complimentary equipment as part of integrated drinking water treatment systems. TIGG also offers other potable water treatment services including water treatment equipment rental programs and carbon exchange services. TIGG has an experienced staff to work with you on your specific municipal water treatment facility needs. 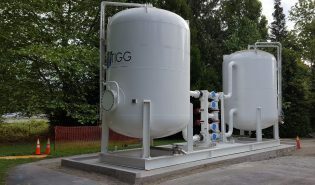 In addition to drinking water purification systems, TIGG manufactures potable water storage tanks, hydropneumatic surge tanks, and wastewater treatment vessels.